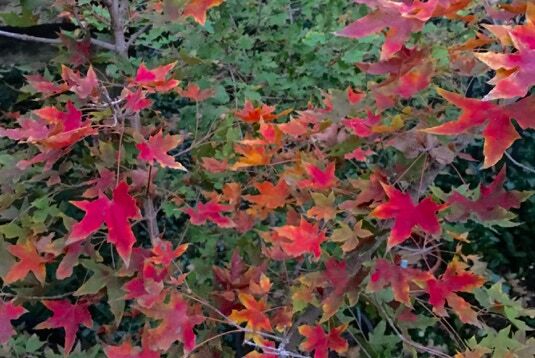 In recent times the discovery of a wide range of sizes, habits, and colors of Shandong maples has been revealed, many cultivars arising from Metro Maples, Fort Worth, TX. Many were created by inbreeding of the first cultivar ‘Fire Dragon’ ® (PP#17367), but I believe the unusual amount of heat in Fort Worth with its related stress, combined with an unique growing style also played an important part. Many cultivars are propagated in limited quanity and only available at Metro Maples. More recent discoveries are yet to be fully tested and made available to the public. The possibilities are endless though, if enough people take the time and effort to find and share great new plants. See bottom for licensing and propagation rights to grow either ‘Fire Dragon’ , ‘Super Dragon’, or ‘Baby Dragon’, all are fully patented and federally trademarked. ‘Fire Dragon’ TM Shandong Maple. PP #17,367. The first truncatum cultivar was ‘Fire Dragon’ ®. A chance seedling in 1999 it was so brilliant red in the fall that propagation began in year 2002 and by 2006 there were already 4,000 of them from one small seedling. It is a little lighter green than normal in summer after starting the year with a distinctive burnt orange coloration. Summer growth colors can be red but never the usual reddish-purplish. The leaf is smaller than typical with prominent teeth, sometimes with rearwards facing basal lobes (not truncate), and the 5 leaf lobes are equal in size giveing a rounded, more elegant appearance. (Trees grown in cooler climates may have longer central lobes and more wavy margins.) Vigorous to 35 feet tall and wide. A rival to ‘Fire Dragon’, it grows with an upright pyramidal shape to 30 feet tall by 20 feet wide. Central leaf lobe is longer and leaf base is truncate. Introduced by Mark Weathington, currently Director at JC Raulston Arboretum. A very small leaf dwarf with a dense, mounding and weeping habit. Could grow to 9 feet high by 15 feet wide in twenty years but can be more upright in shade. 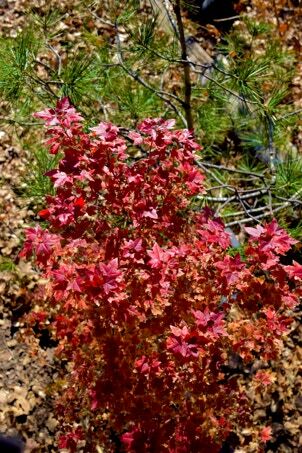 Exhibits exceptional pink to purplish-red new growth colors all year long. Yellow fall colors that can be mixed with red and orange. A vigorous grower that is also well suited for patio or bonsai use. ‘Baby Dragon’ ® is available at Metro Maples. 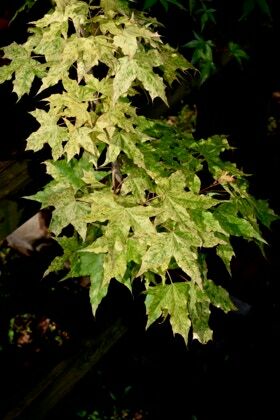 A mid-size Shandong maple with exceptional greenish-yellow leaf color all growing season. New growth is orange, pink or pinkish-red over the yellow leaves. Main leaf veins are a much lighter yellow to white, and a striking contrast. Grows to 15 feet tall to 20 feet wide in a fountain shape with long branches but small side branches. 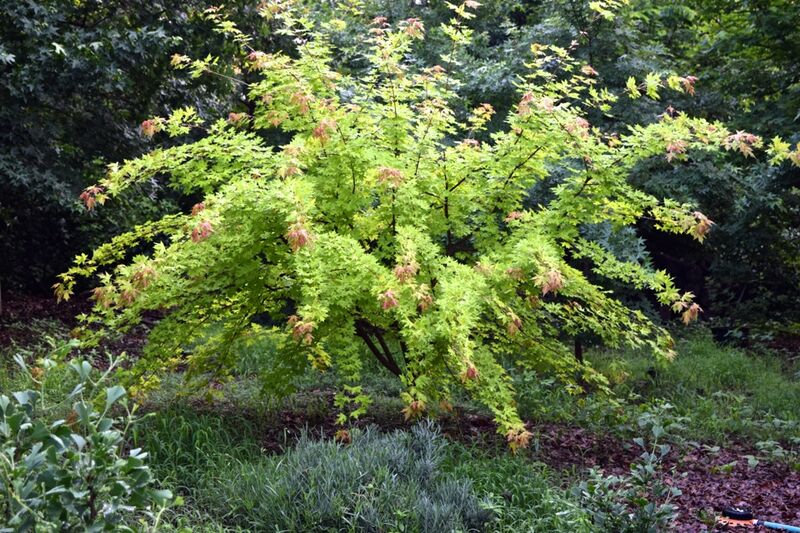 Takes the hot sun better than most yellow leaf maples but should receive some afternoon, or late afternoon protection in extremely hot climates (like Texas). 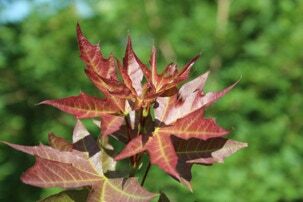 A hybrid cross of Shandong with Norway maple with purple leaves that persist throughout summer with increased heat tolerance from its Shandong parent. Very similar tree in all appearances to Norway maple ‘Crimson King’ has a pyramidal shape 35 ‘ x 25’. Other new hybrids include ‘Norwegian Sunset’®, ‘Pacific Sunset’®, ‘Ruby Sunset’®, and ‘Urban Sunset’®. Available at J. Frank Schmidt Nursery, Boring, OR. A mid-size tree growing to 18 feet tall by 15 feet wide. Very large leaf with 2 sets of prominent teeth on the lobes. New growth colors of pink and greenish-yellow and excellent red fall color. Occasionally available at Metro Maples. Columnar to 40 feet tall by 15 feet wide. Summer growth a deep purplish-red with a normal truncate leaf shape. Attractive bark. Listed as mid-size as even though it gets tall, the trunk and branches are smaller than normal for a tree of this height. Yellow fall colors. Very similar to ‘Fire Dragon’® except ‘Fiya Dragon’ has a much slow growth rate and smaller leaves. Leaves are about half the size and also have wavy margins (see center above comparing the larger ‘Fire Dragon’ ®and the smaller ‘Fiya Dragon’ and even smaller ‘Flower God’). Growth rate on ‘Fiya Dragon’ is one foot per year to 15 feet. Selected from many trees that had a leaf with prominent teeth and backward facing basal lobes that would also color-up at the same time, and compliment ‘Fire Dragon’. Mature height 25 feet by 35 feet wide. 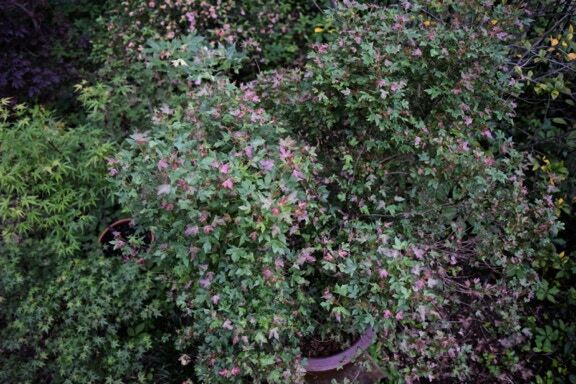 Vigorous growth, especially horizontally, giving a little weeping appearance when branches are full of leaves. Fall color is usually solid golden yellow. Summer growth is a bright reddish-purple. Narrow skinny lobes with wavy margins and slightly rolled that will flatten out in the heat. 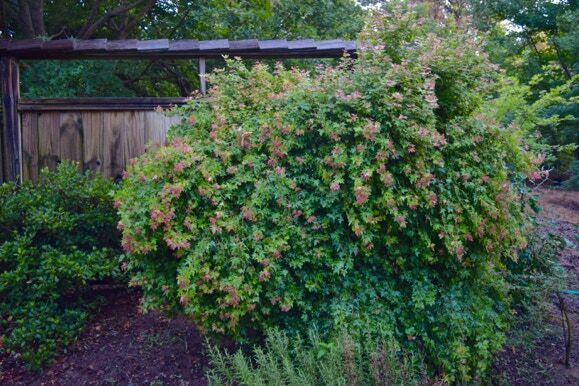 Vigorous grower to 20 feet tall and 18 feet wide. Fall colors are yellow but can be orange to red. Variegated cultivar with lots of pink and yellow new growth, turning to green and white. Yellow fall colors. Not currently available at Metro Maples, now under phase 2 propagation to ensure stability of variegation patterns. The first of the smaller mid-size trees was ‘Tarp Dragon’ it grows slowly to only 15 feet. It also has the most beautiful leaf with sharp teeth on every lobe and rearward facing basal lobes. Early spring colors are very nice with reds but doesn’t last long. Fall colors are yellow, occasionally mixed with red. TARP was named during the bank bailout program but actually stands for ‘targeted acer reduction program’ as many customers thought a thirty foot ‘Fire Dragon’® to be too big. I’ve turned the original TARP into a bonsai, and it has exceptional looking bark. Size is 15 x 15 feet. 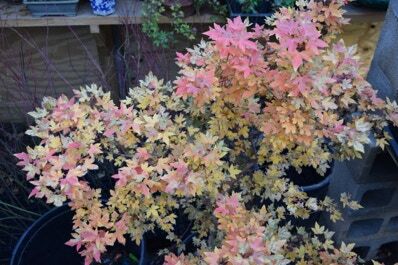 Small leaf dwarf cultivar from ‘Fire Dragon’®seed it has a rounded tumbleweed shape with colorful new growth and fall colors. Leaves slightly smaller than ‘Baby Dragon’® with narrower lobes and with more taper. It grows many long and slender shoots off the trunk and main branches, with very little short side branches. Fall colors go from pink to orange to red. Size is 9 x 12 feet. A vigorous, upright growing dwarf from ‘Fire Dragon’ seed with very small one inch leaves. New growth is pink to red, fading to a light green, then to dark green. 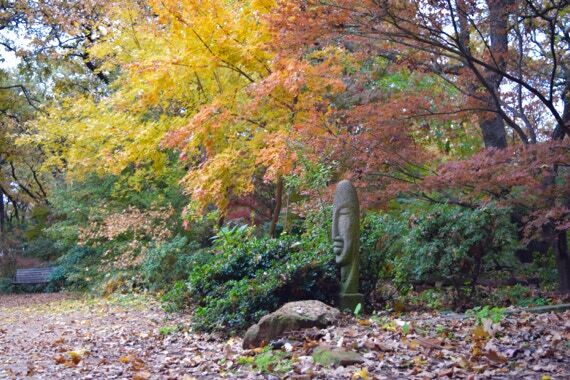 Fall colors are yellow-orange changing to the bright red of ‘Fire Dragon’. Size is 12 by 7 feet. Dwarf selection from ‘Fire Dragon’ with a typical truncatum branching. Exceptional colors and slow growth to 7 x 7 feet.